In the last few days, it seems like I’ve been working on every project all at once. However, one particular project is coming along nicely. 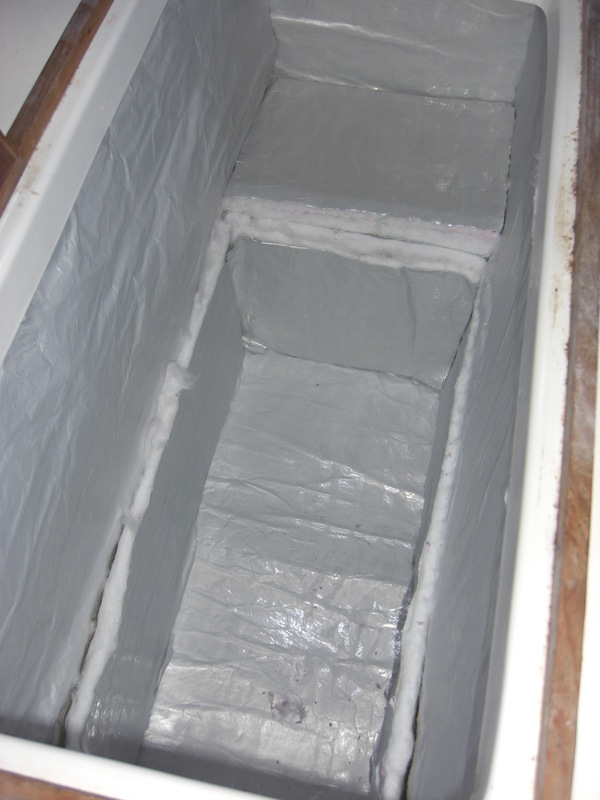 I’ve added significant insulation to the icebox in preparation for installing 12 volt marine refrigeration. While all told this will be a slightly north of $2,000 project, everyone we have talked to that added refrigeration tells us that they can’t believe they waited as long as they did to install it. I’ve always said it would be the one luxury I would add to the boat. Lets be honest, I like my beer cold. Oh, and it will help food keep longer, so we can have fresh veggies further into an extended passage. I started by ordering enough (too much, to be honest, anyone want some leftovers?) Aerogel insulation. This is a material that supposedly has the highest R value per inch, and I put to 10 millimeter layers around most of the icebox. This material is not cheap, and if you work with it I recommend gloves and some sort of mask as it produces a lot of very fine white powder, one that I don’t think should be going up your nose. Not to say any fine white powder should be going up your nose, just to clarify. 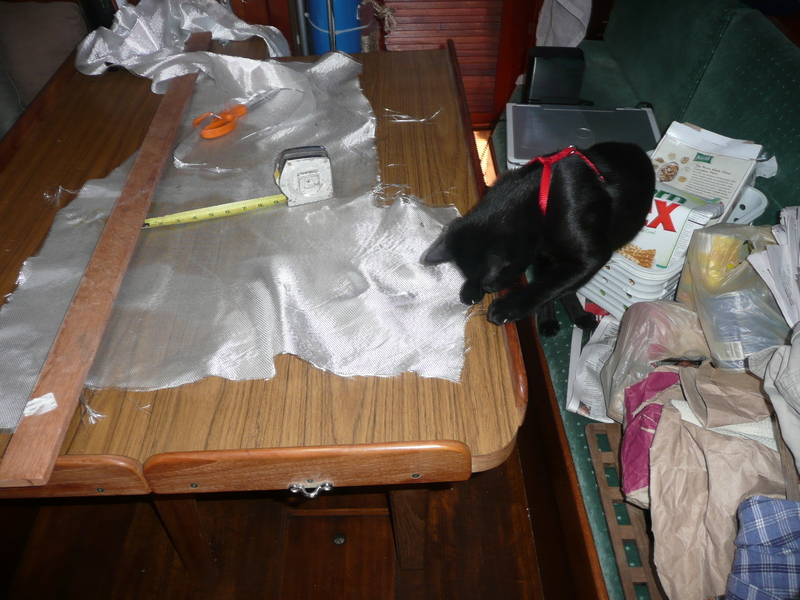 I ordered material with a vapor barrier, and cutting it on the dock with a utility knife was quite an adventure. It is not the easiest material to cut, especially when there were angles involved. 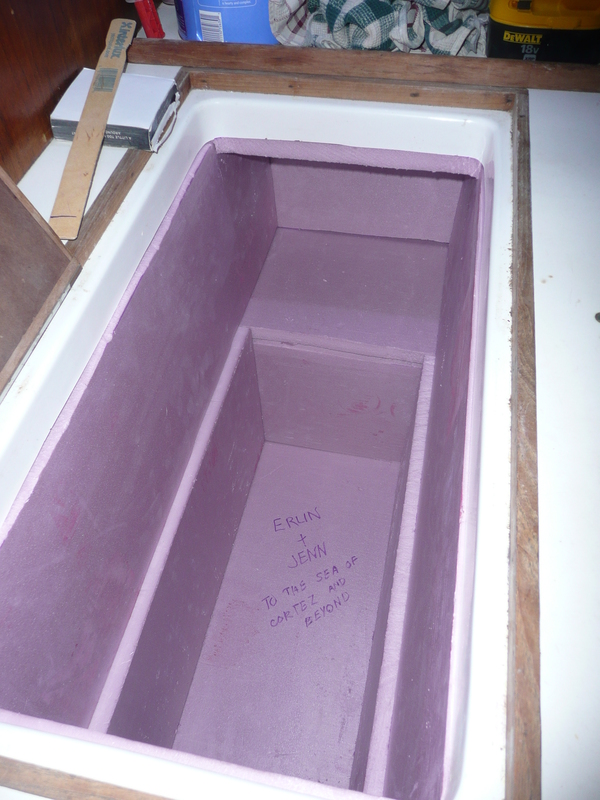 the icebox is about 2 cubic feet smaller and ready for paint and an evaporator plate. will tell if this is wise choice, because it goes against what most people say you have to install for the tropics, but the SeaFrost website had some test numbers showing their system to be more efficient than one with water cooling, and the installation will be significantly less complicated. I’ll write and update once it is up and running to report my results. The other remaining step it to insulate the lids, as heat does rise so it is an important step. In other news, the storage unit is just about finished, everything is organized by the location of its destination, be it boat, donation, or sister’s generous offer to store some keepsakes. I’ve began the installation of the wind vane, and after some hold ups making backing plates I finshed them up tonight and can tackle bolting the unit onto the stern this weekend. I’ve installed a new thermostat and impeller on the engine, which is currently sans heat exchanger while I determine if it can be cleaned out or I should replace it. I measured the rigging today with a rigger and will hopefully be installing all new standing rigging next week. My chartplotter, radar and transducer should arrive Monday, I have solar panels picked out and am waiting for an email back on the next step in the ordering process after getting a quote.